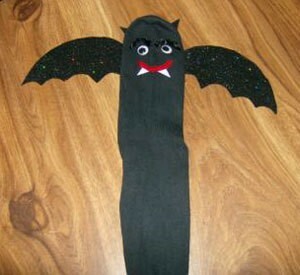 Sock puppets are fun to make and even more fun for your little ones to play with. 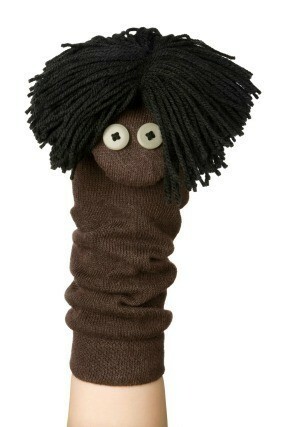 This is a guide about making a sock puppet. 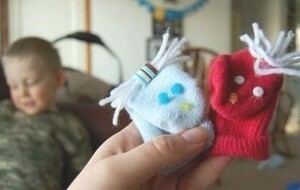 Turn mismatched baby socks into cute little friends for your kids. They are the perfect size for little hands. Select baby sock and accessories. Hot glue beads to make face. Hot glue yarn to make hair. Hot glue other accessories such as ribbon, etc. Voila! If you wish, you can use a needle and thread to attach accessories. Take black sparkle felt (or foam or reg felt) and cut out two bat wings and 2 little ears. I made a template out of regular paper before I cut into the felt. Glue wings so sparkle side is facing front. Glue wiggle eyes on front. I used the fringe yarn they have now for around the eyes, but it is not necessary. Cut a piece of red chenille stick for mouth and glue. Cut fangs from white felt, paper, whatever you have, and glue to mouth.